2018 World Cup Qualifier: FIFA orders South Africa vs Senegal clash be replayed – Royal Times of Nigeria. 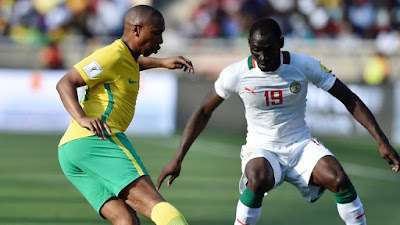 The world football governing body, FIFA, has ordered a World Cup qualifier clash between South Africa and Senegal to be replayed after a Ghanaian referee who has been banned for life manipulated the match. Ghanaian referee Joseph Lamptey awarded a penalty for a nonexistent handball in the previous game which was played on the 12th of November, 2016 which South Africa won 2-1 and was subsequently banned for life for match manipulation by FIFA in March. African soccer’s governing body (CAF) in a report said that Lamptey was guilty of poor performance in the match and awarded a wrong penalty for handball despite the fact that the ball never touched the hand of the player.